The roots of the MOAB go back to World War II when the Allies encountered targets, such as submarine pens and buried V-3 supergun weapons that conventional bombs could not damage. The British developed the Tall Boy and Grand Slam giant penetrating bombs, as much as 22,000 pounds of reinforced steel and TNT that could drive deep underground before detonating with an earthquake like effect. The Grand Slam outweighed the total mass of the MOAB, but much of the weight was in the heavy steel casing that allowed deep penetration under the ground. The MOAB is constructed with a light aluminum casing and detonated above the surface of the ground to maximize the blast effect. During the Vietnam War the US military employed another giant bomb affectionately called “The Daisy Cutter,” more formally known as BLU-82, a 15,000 pounder that could blow trees down in a forest or jungle to clear a helicopter landing zone in one mighty burst. The Daisy Cutter was also again used during the War on Terror in Afghanistan in the wake of the September 11, 2001 terror attacks against the United States. Like the MOAB, the Daisy Cutter must be dropped from a C-130’s cavernous cargo bay, as no bomber has a bomb bay large enough to contain such a weapon. American bomb makers also designed and built an even bigger bomb, the 44,000 pound T-12 Cloudmaker, fielded in 1948 and removed from the inventory in 1958, dates that coincide with the active duty of the B-36 Peacemaker bomber, the only airplane of the time capable of hauling such a bomb into combat. The T-12 was retired without ever being dropped in anger. T-12 casing at the United States Army Ordnance Museum, Aberdeen Proving Ground, Aberdeen, Maryland. Photograph by DJBR at English Wikipedia. Only 15 MOAB’s are known to have been built, at a cost of $170,000 apiece. Of course, reopening the manufacturing line of the big boomers would mean a much higher current price. Fears of causing unintended collateral damage (i.e., killing innocent people) limits the use of the massive bombs. In fact, despite our assertion that no innocent people were killed in the April 13, 2017 dropping of a MOAB on Afghanistan, Afghans have asserted that a teacher and his son were among those killed. This allegation is not proven. The alternative to such gigantic bombs to create the desired blast effect is a small nuclear weapon, the use of which would create problems in the form of nuclear radiation and fall out and also problems of a political and public relations nature. The only 2 times a nuclear bomb has been used in combat were the bombs dropped on Hiroshima and Nagasaki, Japan, in 1945. As terrible as the conventional giant bombs are, certainly small nuclear weapons are worse! 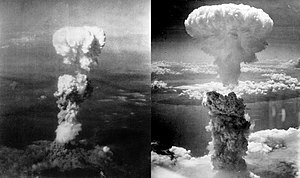 Atomic bomb mushroom clouds over Hiroshima (left) and Nagasaki (right). Photograph by George R. Caron (1919–1995) for for File:Atomic_cloud_over_Hiroshima.jpg. Photograph by Charles Levy (1918–1997) for File:Nagasakibomb.jpg. Question for Students (and others): Should the US be ultra-cautious of causing collateral damage when bombing an enemy? Please let us know in the comments section below this article. Hayward, Joel. Air Power, Insurgency and the War on Terror. Royal Air Force Centre for Air Power Studies, 2009. Lindqvist, Sven. A History of Bombing. New Press, 2003. Werrell, Kenneth. Death from the Heavens: A History of Strategic Bombing. Naval Institute Press, 2009. The featured image in this article, a GBU-43/B Massive Ordnance Air Blast bomb striking an ISIS-K cave and tunnel systems in the Achin district of the Nangarhar Province in eastern Afghanistan at 7:32 p.m. local time April 13, 2017, is a work of a U.S. military or Department of Defense employee, taken or made as part of that person’s official duties. As a work of the U.S. federal government, the image is in the public domain in the United States. This file, which was originally posted to https://www.dvidshub.net/video/519242/aerial-footage-moab-bomb-striking-cave-tunnel-system, was reviewed on 16 April 2017 by the administrator or reviewer Daphne Lantier, who confirmed that it was available there under the stated license on that date. Next Article Breaking News! Tiger Woods Wins 2019 Masters Golf Championship, His 15th Major Win!